Paper tearing is a simple technique that can be successfully incorporated into any layout. Featured in For Keeps Issue 25 2004, this layout shows how the combination of paper tearing and stickers can create a gorgeous layout in a matter of minutes. 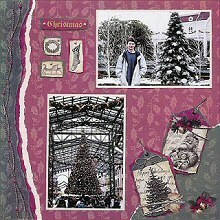 This layout was created using Karen Foster Red Holly 12x12 paper, Karen Foster Green Holly paper, tan cardstock, pop dots and Karen Foster Christmas stickers. Begin by adhering your border sticker to tan cardstock. Carefully tear the cardstock to follow the contour of your sticker. Tear slowly and towards you. This is the hardest step but if you take your time, you will love the effect. Once finished, adhere your border down the left-hand side of your Karen Foster Red Holly 12x12 paper. Next, tear a corner of your green holly paper and adhere to the bottom right-hand corner of your page. Mat your photos on tan cardstock and adhere in place. Finally, adhere your stickers in place, as shown in the layout. If you wish, you can adhere one of the bells in the bottom right-hand corner with foam tape or a pop-dot. This helps give your page a little added dimension. And voila! You are done! How quick and easy was that!